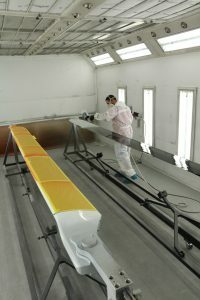 Paint is a key component in preserving a composite rotor blade. A good paint job not only makes the blade (and therefore the aircraft) look good, but it also protects the carbon fiber skin from environmental and ultraviolet light (UV) damage. VHA’s Paint Department performs all paint-related finishing operations, including sanding, prepping, priming, painting, and polishing blades prior to delivery. 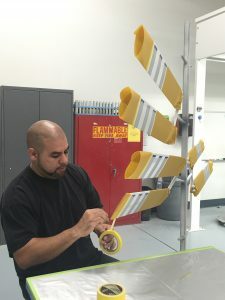 From the UH-1 and 206 tail rotor blades to the 16-foot long 206B main blades, Paint Department personnel touch every blade that leaves the VHA facility. Paint Department personnel prepare newly manufactured blades for the paint process by sanding and priming each blade individually. Each blade is sanded smooth for the best paint finishing look. Blades are then cleaned and wiped with solvent to remove any debris before being hand sprayed with primer. Once the primer sets, the blades are ready to be painted with the base coat. 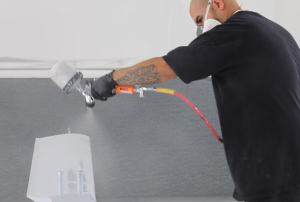 VHA uses a two-stage aerospace paint for best adhesion in tough environments. Each paint blend is mixed in house using precise measurements that result in an evenly-finished product. 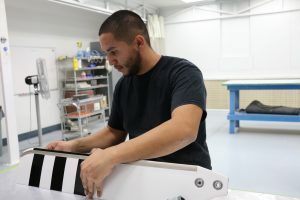 While the majority of our tail rotor blades are white with black stripes, we can also customize the stripe colors or reverse colors (white stripes on a black blade) for an additional fee. Main rotor blades are available in three paint schemes: blue tip, high visibility-black, and high visibility-orange. Color specifications are referenced on the work orders to indicate customization such as stripes or Hi-Visibility paint options. After each blade has been primed and painted, touch ups are completed as necessary. Buffing and polishing techniques add the finishing touches for a clean appearance before the blades are inspected. After the inspection is performed, blades are boxed up by our shipping department and ready to ship. The Paint Department also works with our repair station, Van Horn Repair, to touch up or repaint blades that have been returned for warranty work or repair.